Published by Enough 14. Written by Riot Turtle. The idea to open an Info-Café in Wuppertal (German territory) is about four years old now. Back then there were two squatting actions in Marienstrasse 41 in the Nordstadt district. People wanted to open a social center but the cops immediately mobilized riot squads from several cities of Northrhine Westphalia and evicted both occupations after only a few hours. The cops made clear that they will enforce a zero tolerance policy against squatting actions in Wuppertal. Video and images: Eviction of the Marien 41 squat in August and September 2014. But the idea of opening a city district social center never dissapeared. Again and again people discussed the idea and the necessity to have a daily presence in the district. In the past year 2 more or less leftwing bars were closed in Wuppertal: Multi Kulti and Café Stil Bruch. Every now and then there were still small actions against the speculation with the Marien 41 building, but it became clear that if we wanted to bring consistency in our work we would have to rent something. But that doesn’t mean that people won’t question ownership anymore in the future. In times where the fascists are getting stronger, with the AFD in parliament, some people of the Enough is Enough collective decided to open an Info-Café in the Nordstadt district. A free and open space for the neighbourhood. Because of privatisations more and more public space was taken away, a public space where people can meet without being forced to consume something is needed. With the Enough is Enough Info-Café the collective also makes a statement against this development. On top of that a kind of small gentrification has started in the Nordstadt district in Wuppertal. The Info-Café also wants to counter this process. The Info-Café is a structure that is not aiming just to sell something, but which is a place where people can go that don’t have a lot of money. Apart from Zapatista coffee and pastries we also offer people free tea and free food. They can make a donation but the don’t have too. Apart from clothes that people can buy the Info-Café also has a part with free clothes and other free stuff in the store. Apart from that, people can use the new space for meetings and there will be info-events, documentary screenings and DIY workshops and a reporting point for racist attacks and incidents. Of course other ideas for projects in the new space are welcome. On December 22, the Info-Café finally opened it’s doors. Many people came to the opening and apart from enjoying the free food and free tea, some people brought stuff for the shelf with free stuff and books (In English and German) for the library in the Info-Café. There were a lot of discsussions and proposals for other projects that can be realized in the Info-Café. 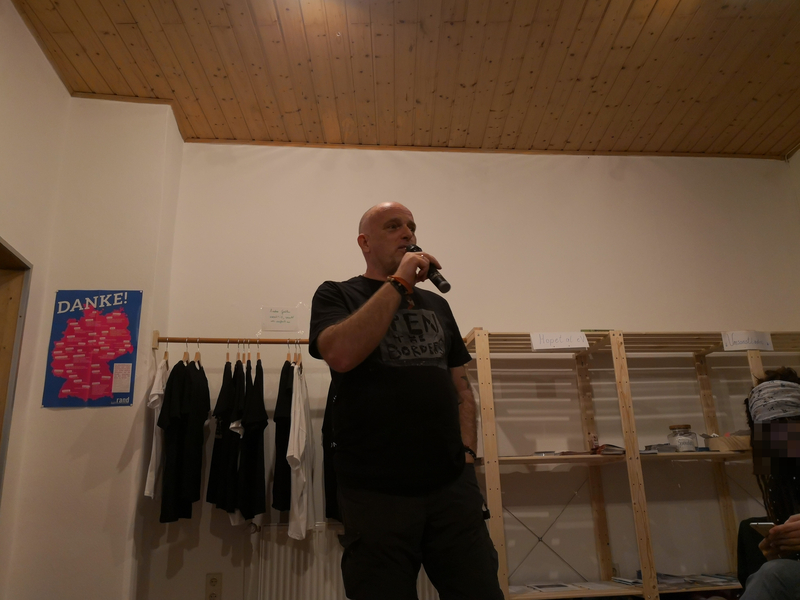 Riot Turtel during the opening of the Enough is Enough Info-Café on December 22, 2018. When you want to support the project, you can do that with a donation. We still need a few bar stools, coffee and tea cups and some other stuff. To celebrate the opening of the Enough 14 Info-Café we offer discounts on many items in our shop to support our new project. T-shirts from 10€ – 15€, and we have some discounts on stickers, posters, hoodies etc.Click here or click at the image below. I am an American anarchist hip hop artist and long time fan of Enough is Enough! I am going to be in the Wuppertal area from 28/7/19 – 2/8/19 and would LOVE to do a show at your new space. What do you think?! Can you write a mail to info@enoughisenough14.org ?